Am I the only one who is currently addicted to all things mustaches? I have to admit, even though they are a little corny, I am absolutely loving that mustaches have become super trendy. Basically, I think they’re fan-stach-tic (ok…that may be a bit overboard). I have loved all of the mustache glasses, coffee mugs, and the like that I have been seeing on etsy and pinterest. The problem is, they are super over-priced for something I know that I can make at home. I have never etched glass before but knew that it was a possibility and would just take a little learning. So, I have studied up and tried etching for the first time to bring you an awesome tutorial and to tell you that you can do it too! I mustache you a question…how awesome is that? 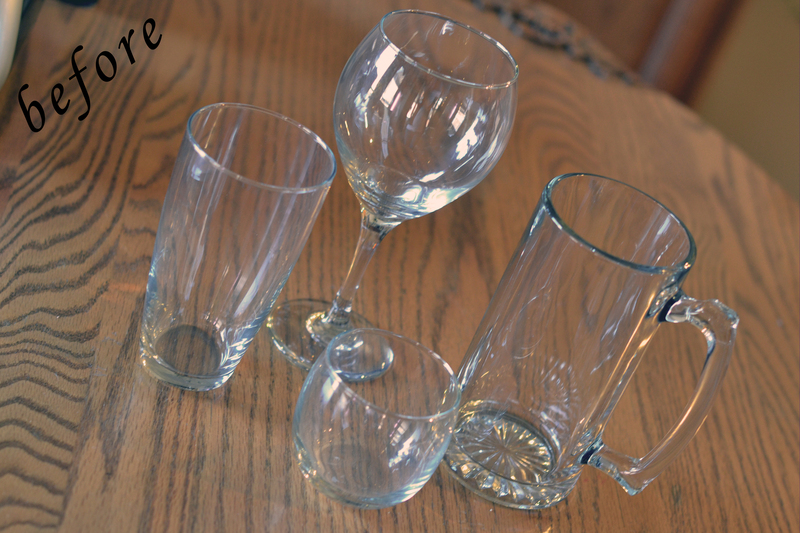 And, I’m so excited about learning how to etch that I have decided to do a giveaway of the glasses you will see etched here! YES! Stay tuned later this week for another post on how to enter! And, make sure to like my Facebook Page or Subscribe to stay up-to-date on everything that’s happening on the blog! *Let me first say that this was my first time etching so some of the edges of the etching are not as crisp as I would like to see. I think this can be remedied and will let you know below how I think it can be avoided! First, here are the supplies that I used. I used the Cricut Expression hooked up to my computer with the new Cricut craft room and the Mustaches and Glasses craft room exclusive to cut out and make the stencil of the mustache onto some vinyl (I say the most cost efficient vinyl you can find, the better–you don’t need anything fancy). I also got four different sized glasses from The Dollar Tree (for – you guessed it – $1 each!) to try the etching on. You will also need some etching cream (available at most craft stores–I got mine at Hobby Lobby) and a small brush to paint the cream into the stencil. 1. 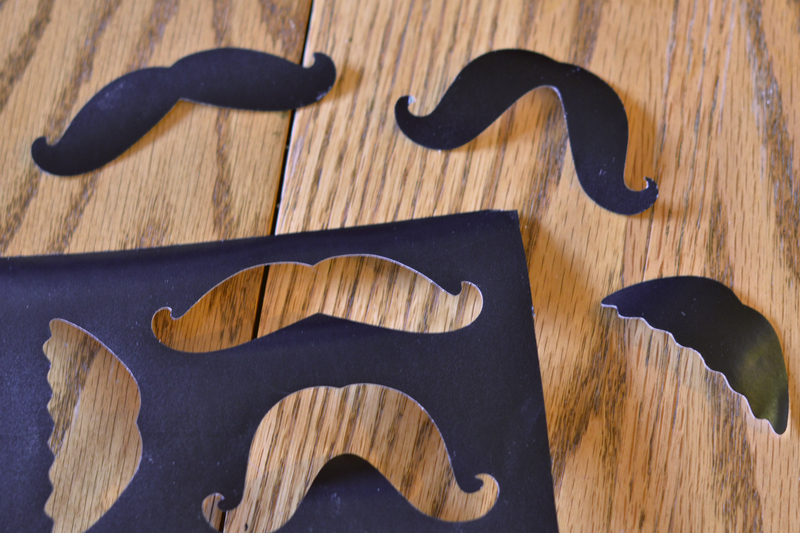 Make a stencil of the mustache. As mentioned above, I used the Cricut Expression machine to cut out the mustache. I found that the new Cricut craft room software (which is FREE and available through the link above) worked perfectly. The mustaches and glasses exclusive was cheaper to buy than an entire cartridge normally is, especially considering I only wanted to use one shape. 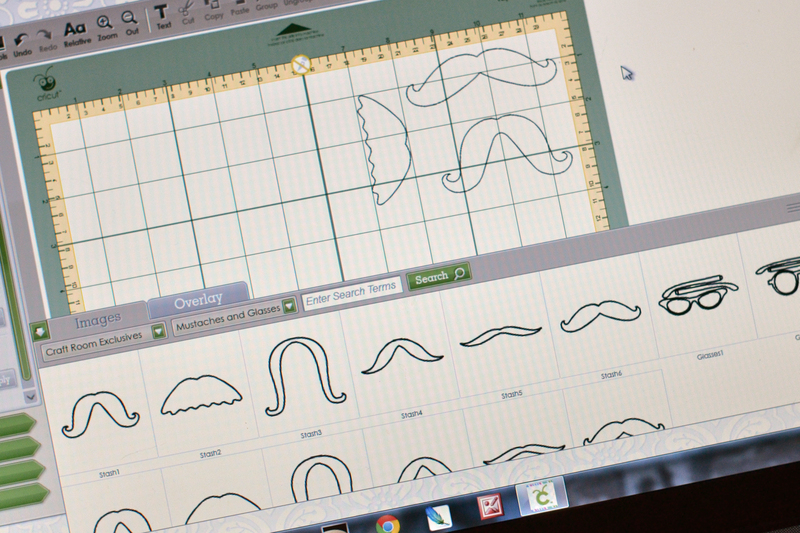 I positioned the mustache I wanted onto the craft room software and used a 1 inch width to determine the size for my stencil. I hit cut and voila! the Cricut machine cut out the mustache on my vinyl. Remember, it is the outline that you are wanting to use to fill in the empty space and make the shape. Cut around your shape. Now you have your stencil. 2. Prepare the etching. Peel the back off the vinyl and apply it to the glass. Make sure that you put it down straight and that all of the areas around the open area are stuck down all of the way (this is where I think I messed up on getting some of my edges crisp). Once your vinyl is stuck, get your etching cream out and follow the directions on the bottle. Apply the etching cream and allow it to sit for a few minutes. I can’t explain the Science behind it (though, I’m sure it’s nerdy and awesome), but there is some kind of reaction that happens to have the etching effect on the glass. Be careful–I have heard that etching cream is extremely toxic and can burn you if it contacts your skin. 3. Finish the etching. After a few minutes of waiting, clean off some of the excess cream with a wet paper towel. Then, rinse it under water. At first, I didn’t think it worked until I took the vinyl stencil off. And there it was: a fan-stach-tic etched mustache. 4. Use your cup! Have fun drinking out of your new hipster cup and make sure to take lots of cool hipster pictures of you sporting your new stache! 5. 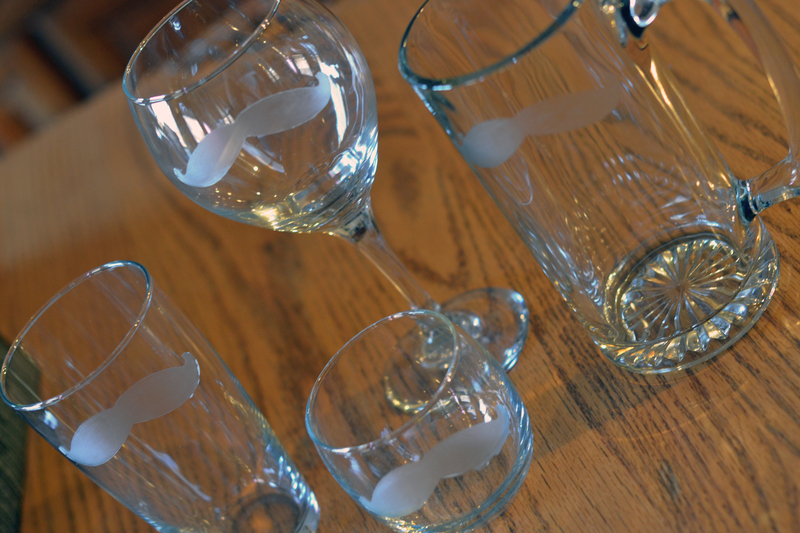 Check back later this week for a chance to win one of the etched mustache glasses below! **That’s it! Please make sure to leave your comments or questions below! 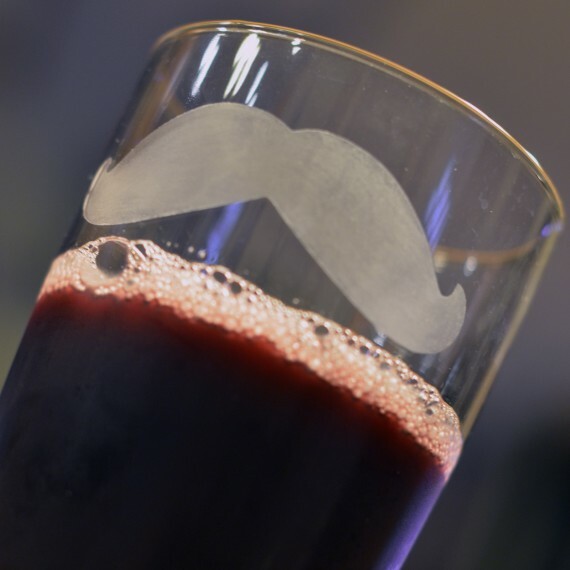 I would love to help you make your very own etched mustache glass! Also, I’d love to hear your opinion on anything related to this blog post — do you like etching? are you a fan of mustaches? do you think this trend will last? Let’s get the comments rolling! Great job! They look awesome! Thanks! Etching is so much fun! Thanks for encouraging me to try it! You have a chance to win one later this week! Keep checking back!